AMSEL'S BIGGER THAN LIFE INDY... THE ONE THAT STARTED THEM ALL!! 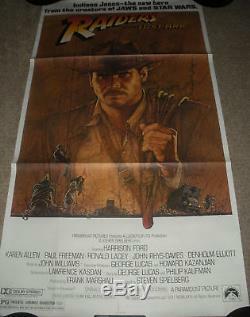 "RAIDERS OF THE LOST ARK" ORIGINAL US 3 SHEET MOVIE POSTER. This RAIDERS OF THE LOST ARK ORIGINAL US MOVIE POSTER is a 3 SHEET POSTER that measures a spectacular 31 X 76 and is SINGLE SIDED. It was originally folded and is in EXCELLENT CONDITION with just a 2 tear on the white border edge of the bottom center fold. It does not affect the image at all. RAIDERS OF THE LOST ARK is STEVEN SPIELBERG'S first collaboration with GEORGE LUCAS. It is a thrill a minute roller coaster ride that pays tribute to the action thriller serials from the 1930's. RICHARD AMSEL'S magnificent art captures INDIANA JONES at his handsome rugged best and makes this poster highly collectible, especially in this overwhelming 3 SHEET size! "INDIANA JONES--FROM THE CREATORS OF JAWS AND STAR WARS". I started collecting NEW and VINTAGE ORIGINAL MOVIE POSTERS especially GONE WITH THE WIND, STAR WARS, SPIELBERG, DISNEY, ACADEMY AWARD WINNERS, BATMAN, LORD OF THE RINGS, CULT, CAMP, TRASH, ETC!!! At the age of 27 in 1976 when I lived in NYC. Needless to say, it is a diverse and eclectic collection of over 650 POSTERS. I also collected ANIMATION ART, specifically ORIGINAL DISNEY HAND PAINTED PRODUCTION BACKGROUND PAINTINGS that went under camera in the filming of Disney movies. The Movie Poster and Animation Art I will present will be interesting, diverse, original and in many cases a rare opportunity for any "collector". Yes, some are Museum quality pieces. And wait till you see what may be COMING SOON TO A THEATRE NEAR YOU!!! We are aware that accidents can happen. Our items will be insured thru the US Postal Service. The item "RAIDERS OF THE LOST ARK ORIGINAL 3 SHEET MOVIE POSTER" is in sale since Tuesday, January 18, 2011. This item is in the category "Entertainment Memorabilia\Movie Memorabilia\Posters\Originals-United States\1980-89". The seller is "tmqposters" and is located in Saint Michaels, Maryland.